From Goodreads ~ Max Martinelli spent her junior year of college in Paris and fell in love. Julien was a wickedly handsome young man who was crazy in love with her, or so she thought. He was a free-spirited artist and she an aspiring architect - impressionable, young, and standing on the brink of womanhood. Max is an self-employed architect in a small town. Three years ago when she was a college student, she spent a year in Paris. She met and fell in love with Julien, who was a struggling artist. When she moved back to the States, he promised to follow her ... but she never heard from him again. For the last three years, she wondered what had happened to him. She feels he still has a hold on her heart and she is unable to move on with her live until she finds out why he never contacted her and if he is okay. So she heads to Paris for two weeks to find him ... so her heart can either let him go or they can still have a future. Though this is the third book in the Memory House series (there are five and this is the fourth one I've read), you don't need to have read the others as this works as a standalone. There are characters from the other books in the series but there is enough background provided. It is the eighth book I've read by this author and I liked it. I am enjoying this series ... there are nice friendships between women. I went for an 4km walk this afternoon and as I cut through at Trinity Bellwoods Park, I stopped in to check on KC's tree. We had a tree planted in the fall of 2011 in memory of our dog, KC. 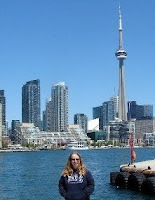 When Gord and I were there two weeks ago, the leaves had changed and looked gorgeous. I wasn't expecting there to be any colour or leaves and I was pleasantly surprised. From Goodreads ~ Every great song has a fascinating backstory. In "Anatomy of a Song", based on the ongoing Wall Street Journal column, writer and music historian Marc Myers brings to life five decades of music through oral histories of forty-five transformative songs woven from interviews with the artists who created them. 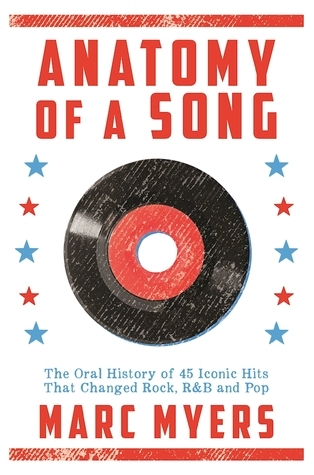 Bringing readers inside the making of a hit, "Anatomy of a Song" includes the Isley Brothers' memorable song "Shout," Led Zeppelin's "Whole Lotta Love," Janis Joplin's "Mercedes Benz," and R.E.M's "Losing My Religion." After receiving his discharge from the army in 1968, John Fogerty does a handstand and reworks Beethoven's Fifth Symphony to come up with "Proud Mary." Joni Mitchell remembers living in a cave on Crete with the "mean old daddy" who inspired her 1971 hit "Carey." Elvis Costello talks about writing "(The Angels Wanna War My) Red Shoes" in ten minutes on the train to Liverpool. And Mick Jagger, Jimmy Page, Rod Stewart, the Clash, Jimmy Cliff, Roger Waters, Stevie Wonder, Keith Richards, Cyndi Lauper, and many other leading artists reveal the emotions, inspirations, and techniques behind their influential works. "Anatomy of a Song" is a love letter to the songs that have defined generations of listeners. This is an interesting book if you are a music lover. The author has a column in the Wall Street Journal and this is a collection of some of the interviews he has done. The 45 songs are a subjective collection of music milestones the author believes provides us with a greater understanding of the songs, the artists and the music's history. They are stand-ins for the music's major turning points. Each song has an introduction to explain its historical significance. The interviews are with the singers, songwriters, producers, musicians, etc. The songs are in chronological order starting with Lloyd Price's Lawdy Miss Clawdy from 1952 and ending with R.E.M. 's Losing My Religion in 1991. The author stopped at 1991 because he feels a song isn't iconic until it has stood the test of time of a generation, which is 25 years. It was interesting to get the background on how and why the song was written and what was going on at that time in the world and also in the lives of those involved. Did you know that Midnight Train to Georgia was originally based on Farah Fawcett telling the song's composer that she was catching a midnight flight to Houston? Read this book and you'll learn lots more! Gord and I attended an event this afternoon at the International Festival of Authors (IFOA). The event was called Stories of Redemption. Darren Greer, Anosh Irani and Cordelia Strube present multifaceted and diverse stories about redemption and returning to face the past and/or the truth. Sheniz Janmohamed was the host. She introduced the three authors, who read from their latest books. Gord and I went to the East Coast Comedy Night 3 at the Social Capital Theatre (above the Black Swan Tavern on the Danforth) tonight. Our THIRD big year, with two big shows! For one night, in one room, we will pack as many comedians and performers from all over The Maritimes and Newfoundland to salute the East Coast. Nova Scotia-style donairs will be available at special comedy pricing and supplied by The FUzZ Box. We went last year and it was a hoot! Tickets were just $15 at the door ($10 in advance) and the comedians and musicians were all from the East Coast. I'm originally from the "East Coast" (from Nova Scotia). We bought a couple Nova Scotia-style donairs from FUzZ Box for $5 each. What is a donair, you ask? It's dense spiced ground beef that is thinly sliced and put in a soft wrap. But it's the sweet special sauce that makes it come together. You could get them with veggies (tomatoes and onions) or without ... we got ours without. Marcel St. Pierre was the host ... he was fun. Gord got free tickets for the Zoomer Show from a fella he works with and we went this afternoon. It is marketed as a lifestyle expo for the 45+ ... the attendees seemed to be a lot older (like 60+), though. We walked around looking at the different vendors ... they ranged from financial services to memorial services to bamboo pillows to travel agents and things that will make you feel better and so on. Simply Straight caught my eye and I checked it out. It's a hair straightener that is a brush (I thought it was an odd product to be sold at this show). I never do anything with my hair ... I wash it and brush it ... that's it! Leeanna showed me how it works and let me try it and I was sold.